Sony Cyber-shot RX1 / Carl Zeiss Sonnar T* 2/35 review: Is this the ultimate moderate wide-angle lens? When Sony announced the pro-level Cybershot RX1 at Photokina in September, the combination of full-frame 24-MPix CMOS sensor and high-quality Carl Zeiss Sonnar 35mm f/2.0 in a metal-bodied compact with manual controls sounded promising. Yet, while unique, with a hefty $2,800 price tag it’s not going to appeal to everyone. There are for instance other rival offerings. The $1999 Leica X1/X2 and the $1299 Fuji X100 / X100s, both have fixed high-quality lenses offering the same field of view. The Fuji even offers the same f/2.0 maximum aperture (the Leica Elmarit lens used by the X1/X2 is f/2.8), although both cameras sport smaller APS-C sized sensors. Besides those cameras, there are a number of new full-frame 35mm lens designs optimized for DSLRs. Nikon introduced their first AF 35mm f1.4G type lens 18-months ago while Canon has recently updated the EF 35mm f/2.0 to include IS. Third-party makers have also responded to the increased popularity of the 35mm lens. The ultra-fast and relatively accessibly priced $899 Sigma AF 35mm f/1.4 is an outstanding performer and even Carl Zeiss has two modern manual focus designs, both Distagon T* types, one at f/2.0 the other at f/1.4. With a short back focus, the Sonnar design of wide-angle lenses like this one is particularly suited to mirrorless cameras, and was in the past reserved for rangefinders. This Sony made Zeiss designed prime is a complex design consisting of 8 elements in 7 groups. Information is sparse but it has three elements with aspherical surfaces, one being an “Advanced Aspherical” (AA) type, although what that means precisely isn’t clear. Unusual for this kind of lens is a dedicated macro mode, which allows focusing down to just 14cm. Also of note is the circular iris consisting of 9 aperture blades to help produce smooth gradients to out-of-focus areas. Before we take a look at the lens, we should just recap on the Sony RX1’s sensor performance, which by all accounts was a stunning result. The RX1 has the best performing sensor of any high-end compact or mirrorless camera in our database and indeed comes just behind the Nikon D800/D800E and D600 DSLRs. The individual scores speak for themselves. The high Portrait score of 25.1 bits is ahead of the Nikon D3x and equal to the new D600, while the huge Dynamic Range of 14.3 Ev is only bettered by the Nikon D800. The Sports (Low-light ISO) use case score is also impressive but it can’t quite reach the same lofty positions of the Nikons. It places the RX1 6th overall in that category, just in front of the inspiring full-frame Canon EOS 6D. The Sony Zeiss lens has an above average DxOMark score over rival retro-focus types designed for DSLRs, though measurement of Transmission is not possible on a fixed (non-interchangeable) lens. With a high overall DxOMark score of 33, the Carl Zeiss Sonnar T* is a superb performer optically. That score puts it comfortably ahead of the $1,850 manual focus Carl Zeiss Distagon T* 1.4/35 (35mm f/1.4) on a Nikon D3X, which achieved a DxOMark score of 30. That wasn’t the only 35mm f/1.4 lens that achieved that score, though. The manual focus Samyang AS UMC and the new autofocus Sigma DG HSM model also attained an overall DxOMark score of 30 when measured on a D3x and Canon EOS 5D Mk II, respectively. Individual metrics show the fixed Sonnar of the RX1 to have excellent sharpness, measured at high 18P-Mpix in our labs. The Zeiss Distagon T 35mm f/2 ZE Canon, a retro-focus design incorporating nine elements (with one lens made of low-dispersion glass) achieved a moderate 15P-Mpix score when measured on a Canon EOS 5D Mk II. However, at maximum aperture the sharpness could be improved across the field, it’s sharp in the centre but acutance falls away to the edges and corners. Also bear in mind because the Sonnar is fixed, non-interchangeable lens we’re unable to measure Transmission. As a result, the overall DxOMark score doesn’t take that into account. A poor result could lower the score, but the opposite is also true. Measured at 0.7%, the lens has some slight but still noticeable barrel distortion. It’s not complex, or ‘moustache’ type distortion and so it would be easy to correct in software. Some slight barrel distortion is noticeable but it’s average for a lens of this focal length. Chromatic aberration is slightly higher than we might expect. Although it’s much lower than some high-grade zooms, for a modern prime it’s a slightly surprising result. 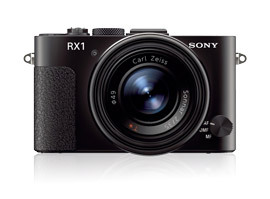 The Sony RX1 has been introduced at the same time as a number of other 35mm prime lenses designed for DSLRs. While DSLRs are more flexible, direct comparison between the cameras is still valid. At $899, the new Canon EF 35mm f/2 IS USM seems a little high in price and yet, at $2,999 when paired with the new full-frame Canon EOS 6D, for example, is a similar price to the RX1. It can’t be compared in size but, optically, the image stabilised Canon lens performs very well indeed. It has lower distortion and chromatic aberration than the Sony Zeiss lens, and the Transmission matches the theoretical aperture values. The Canon also has similar levels of vignetting, close enough to be indistinguishable in real-world use. However, with a Sharpness score of 17P-Mpix, it’s not quite as sharp. But, this accounts for only part of the difference in the overall DxOMark Score of 29 for the Canon Vs 33 for the Sony Zeiss. Some of this can be explained by the difference in the noise of the two camera’s sensors – the results of the Canon lens were measured with a Canon EOS 5D Mk II. The DxOMark Score takes into account of both the SNR and Color Sensitivity of the sensors. The results of the sensor comparison of the Sony Cyber-shot DSC-RX1 Vs Canon EOS 5D Mark II reveal the Sony camera has a 1/3rd stop advantage over the Canon model. Not only that, but the Color Sensitivity of the 24-Mpix Sony sensor has 1.5 bits difference or 2/3rd stop improvement at base ISO. These two points, a direct consequence of the sensor quality contribute to the higher DxOMark score of the Sony Zeiss over the Canon combination. The same applies to the new Sigma. It’s a ‘faster’ lens but like the Canon it’s large physical size may count against it for discrete photography. However, few can argue that the optical quality isn’t remarkable. Although it loses out to the Sony in some areas it compares favourably. Indeed it has lower levels of CA and distortion, while vignetting is just 0.3 EV lower, quite extraordinary given the extra stop advantage at maximum aperture. The Sigma also has consistent sharpness across the frame, at least from f/2.8 onwards. Where it can’t quite match the Sony is the sharpness and homogeneity at f/2.0. Although sharper in the centre there’s more softness than the Sony at the edges. At f/2.0 the Sigma shows improvement in the outer field when stopped down, and is slightly sharper in the centre than the other two but the acutance is marginally lower at the edges and corners than the Zeiss. When stopped down from f/2.8 onwards there isn’t much between the three though the Zeiss is the most consistent across the frame, while the Canon has slightly lower acutance in the outer field. All three autofocus lenses have very good sharpness and their performance is close. Nevertheless, the extra 1P-MPix score of the Sony Zeiss over the two main rivals can be explained simply enough. First, the Sony sensor has a slight advantage in pixel count over the Canon EOS 5D Mk II (albeit at the expense of efficiency) but mainly because the Zeiss is marginally sharper centrally across the f/2.8-f11 range of apertures than either the Sigma or the Canon. At f/2.0 the Sigma is sharper centrally than both the Zeiss and Canon, but it’s not enough to alter the overall score. At f/2.0 the Zeiss performs well but both the Canon and the Sigma are marginally sharper centrally. When Sony announced the RX1 it both excited and intrigued photographers around the globe, it was a bold step and a unique offering. With all their experience not even Leica, or Fujifilm, have attempted to meld a fixed high-quality, high-speed prime with a full-frame sensor in such a compact form. The result is a highly attractive, if somewhat pricey, camera of uncompromising quality. The Zeiss designed, Sony made lens is an integral part of that. Its optical performance is outstanding, and particularly noteworthy for its consistent sharpness and homogenous imaging across the frame. With excellent image quality at maximum aperture becoming outstanding at f/2.8 and on, the Zeiss Sonnar T* 2/35 is likely to become a classic, against which all others are judged. Of course the lens can only be obtained with the purchase of the RX1, a camera that is not entirely without its own quirks and shortcomings. In spite of this, if you have the money to invest, then close to perfect imagery is assured.